American Odyssey, Smash, and theater actress Tala Ashe has been added to the cast of DC’s Legends of Tomorrow as a series regular for Season 3. 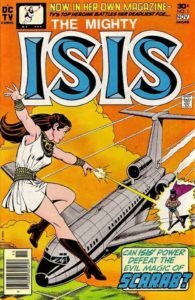 Isis grew to prominence at DC Comics during the 52 storyline in which she was a bit of a female equivalent of Captain Marvel/Shazam – a similar role to the one that she had in her own Filmation 1970’s TV show that was often paired with the Shazam! TV series. A Muslim-American woman from the year 2030, Zari lives in a world of contradictions. Technology has brought about incredible change in her future — too bad human nature hasn’t kept pace. Fear, prejudice, and a lack of care for the planet have forced Zari to become a “grey hat hacktivist.” A computer nerd with a wry, combative attitude. A woman living a double life who doesn’t realize that she has secret, latent powers derived from an ancient, mystical source. This isn’t the first time Isis has appeared on The CW, by the way: The Smallville Season 10 episode “Isis” saw Erica Durance’s Lois Lane turned into the super-powered character. We shall see if she goes with the name of the legendary goddess or if the show conveniently avoids that connotation. Who knows; maybe she is descended from the original Adrianna Tomaz and chose not to adopt the name because of what it’s become in the early 21st century. DC’s Legends of Tomorrow Season 3 will air this Fall on Tuesdays following The Flash.